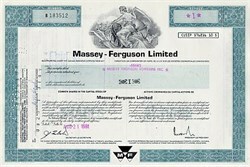 Beautifully engraved Stock Certificate from The Massey Ferguson Farm Equipment Company issued no later than 1981 for shares of Common Stock. This item has an ornate blue border around it with an allegorical figure in front of the world globe as a vignette. The certificate has the printed signatures of the company's officers. The name Massey Ferguson was coined in 1958 � a shortening of the name Massey-Harris-Ferguson. This company had been formed in 1953 after the merger of the famous North American company Massey Harris with Harry Ferguson Limited of England. Harry Ferguson was a brilliant engineer who brought about a major change in tractor design with his revolutionary three-point-linkage system that allowed both tractor and implement to work as an integrated unit. Today, virtually all tractors are based in some way on his unique ideas. The history of Massey Harris goes back to 1847 when Daniel Massey opened a workshop to build simple farm implements in Nwcastle Ontario, Canada. A decade later � also in Ontario - Alanson Harris established a foundry to make and repair farm machinery. Massey and Harris both became pre-eminent in harvesting machinery and eventually the archrivals merged in 1891. The new company was responsible for producing the world�s first commercially successful self-propelled combine in 1938. Massey-Harris merged with Harry Ferguson in 1953 and brought together their twin skills in harvesting machinery and tractor design to produce one of the world�s most powerful forces in farm equipment. In 1995, Massey Ferguson was purchased by the US-based AGCO Corporation.